Hildegard of Bingen, one of the most admired and loved figures from the middle ages, was born on September 16, 1098, in Bermersheim, Rhineland. She was born into nobility, and was the tenth child of Knight Hilderbert and his wife, Mechtild. It was decided upon her birth that her life would be devoted to religion, hence, upon reaching the age of 8, Hildegard was admitted into the Benedictine monastery in Mount St Disibode to receive an education required for a nun. She was brought up under the supervision of a reclusive nun, Jutta of Sponheim, who later became the Mother Superior. The Benedictine monastery followed the Celtic tradition, and therefore, it was open to both men and women, although they resided in separate quarters. Hildegard spent her youth educating herself in Latin and other religious texts, and she became extremely well-versed. She also began experiencing visions where God would communicate with her, however, she kept this a secret. Upon reaching the age of 18, Hildegard received the status of nun, and twenty years later, 38 year old Hildegard succeeded Jutta as the Mother Superior upon her death. 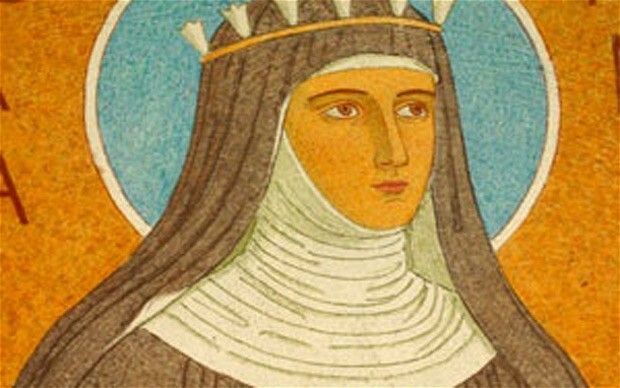 Upon gaining the status of Mother Superior, Hildegard had a vision where God commanded her to spread the knowledge of her visions, and hence, with the assistance of a monk, she spent the next decade compiling and describing her dreams, and also providing an analysis on their interpretation and significance. Her work came under the notice of the Papacy, and Pope Eugenius III sent a commission to inquire after the credibility of her work. The commission was very sceptical of her visions and teachings, however, the Pope discarded their views, and granted her approval. The abbey, under the supervision of Hildegard, became a sanctuary for the other nuns, and soon, it became flocked with the arrival of an increasing number of novice nuns. As a result, the abbey became overcrowded and cramped, there arose the problem of inadequate rooms for the nuns residing there. Therefore, Hildegard decided to relocate the nuns to Rupertsberg, near Bingen, where she wanted to build another monastery for them. However, this decision did not sit well with the abbot, who began creating skirmishes. In 1150, Hildegard became embroiled in a certain disaccord with the abbot, who wanted her to settle down at St. Disibod, while she was adamant to go to Rupertsberg. After a prolonged squabble, she left the abbey, accompanied by 50 nuns, and set down to the task of constructing a new abbey. She supervised the construction herself, and was even responsible for designing certain features of the building which were unusual and never proposed before during those times, such as the water pumped in through pipes. The fame of the abbey spread, and soon, it too became cramped to the increasing influx of nuns. Hence, in order to accommodate the incomers, Hildegard began the construction of another abbey, 8 miles away from the former. Like the former abbey, Hildegard was responsible for the design of the new abbey as well. She added to the design modern ideas and plans such as water pipes and large workshops. The atmosphere in these abbeys was that of jovial co-existence and contentment, the nuns were encouraged to engage in intellectual and artistic endeavours. Hildegard was a strong advocate of reading, studying and discussing theology, taking warms baths, exercising regularly, singing and playing musical instruments. Her distrust of local water is famous, as she was the only superior to have promoted her nuns to consume beer instead of water. Hildegard possessed remarkable healing abilities and she had garnered immense respect as a doctor, people began flocking to her side to benefit from her healing prowess, and soon, she gained the title of miracle woman. She even composed two books on medicine, ‘Scivias’ and ‘Causae et Curae’, that covered a wide range of medicinal cures involving herbs. She also composed works on botany, geology and biographies on the lives of saints. Hildegard was fond of drama, she wrote plays and poetry, and it is a well-known fact the she is credited for the invention of opera, as she wrote and directed the first opera ever performed. Hildegard had an incredible passion for music which she entwined with her love for composing poetry, she has written 70 poems and a musical play, entitled ‘Ordo Virtutum’. The play revolves around a human soul that is torn between listening to the Virtues and the Devil, and eventually settles for the Virtues upon realizing that following the Devil has awful consequences. Hildegard travelled throughout Germany, and even to Switzerland and Paris, to preach and conduct lectures. Even though it was illegal for women to preach during those times, Hildegard’s sermons were attended by hundreds of people, who were deeply inspired by her teachings and requested for written copies of her sermons. She wrote 9 books, of which the widely discussed and acclaimed include ‘Scivias’ (Know the paths), ‘Liber Vitae Meritorum’ (ethics), and ‘De Operatione Dei’, which mainly dealt with account and interpretation of her visions, and provided great moral insight. At the age of 80, she became embroiled in some tensions with the Church upon her defiance in burying a revolutionary on the grounds of her abbey. The Church did not deter even though she explained that the man had absolved his sons before his death, the clerics were adamant to exhume the body. Hildegard played a clever trick on the authorities who came to take the body, she blessed all the graves and removed every tombstone, which confused them and they could not tell apart one grave from the other. This angered the Church and a ban was placed on music and mass within the abbey, however, it was lifted shortly after. She passed away on September 17,1179. In 1940, the Vatican acknowledged her devoutness and spirituality, and she was made a saint. Hildegard of Bingen was not only a philosopher and a Saint, she was also a poet, theologian, singer, author, composer, artist, playwright, doctor, herbalist, botanist, seer, preacher, biographer and architect. Her feast day is celebrated on the 17th of September.